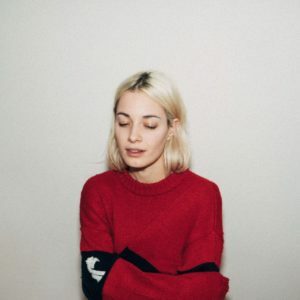 The name of her solo project stands for a specific kind of goose in French and defines her music as “indie/lo-fi” which fits her quite right. Experimenting with electronic sounds and her voice, the track sounds like an ethereal travel into her emotions. Her voice is sweet yet, affirmative. Her sound reminds the early works of James Blake, or even some tracks by Four Tet. She took some time to answer our questions about her music, inspirations and how her solo career is different from the sound of her band. Hey I am Emma! I am a signer and a guitar player in Men I Trust. I also produce my own music in my new solo project called Bernache. I am a French Canadian who loves blue cheese and I would love to own a pig. I started at a young age. When I was about 5 y/o my mother made me start piano lessons. The deal was that I would be aloud to stop around 12. I hated her for that but now, I thank her all the time. I was a very bad student. I started composing simple melodies on the side because I didn’t like the pieces offered. That is what made me fall in love with music. What can you tell us about your debut track “Your Name”? It’s a really obsessive track that I built in loops as an electronic song. I learned working with Ableton live and now I’m having a blast. For this track, I wanted to leave space to the music over the singing. “Your Name” has a raw and masculine feel that contrast my voice. This is really how I feel as a person: I deal with my own opposites. How is your solo work different from your work in your band Men I Trust? Men I Trust is a teamwork that starts with the boys on the instrumental parts. They really have their own style that is fresh and clean. Their styles and reflexes are pretty different from mine. I love it! This project is very personal and I am left alone so I allow myself to explore in it. How did you pick your artist name? What does it mean? I’ve been called like this for a while in my close inner-cirle. “Bernache” is a French word for “Goose”, which is a bird that also happens to have a crappy little voice. It seemed logic to use this as a nickname for my music project. Inspiration comes from sounds when it happens to do music. There is no romantic thoughts or anything else before the music happens. I just have to sit and push myself to play and record it. The sound is the main language and you have to abandon yourself to it in order to be creative. I believe that is the music that gives power to the lyrics and not the opposite. You are in charge of every creative process of your music. How does this process work for you? Oh it can be whatever. A melody a sing randomly, a riff of guitar, piano chords I obsess with, drum beats that sticks in me, etc. Then I add layers until I want to hear it as it is. I’m working on new songs for the next months that I will release as singles. You can follow Bernache over Facebook, Instagram and Soundcloud.